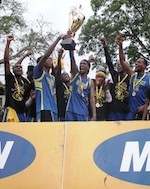 The National Schools & Colleges Basketball Championship 2009 ended on saturday 29th August 2009 at the University of Ghana Basketball Court. The championship which started on sunday 23rd August championship featured all-star players from the various regional senior high schools. The Regional teams included Greater Accra, Cape Coast, Volta Region, Ashanti Region, Brong Ahafo, Northern,and Eastern. The championship had both male and female teams battling for the top spot of been called the best basketball region at the school level. The tournament saw some of Ghana's best young basketball prospects both male and female between the ages of 15yrs and 20yrs. The finals for both tournaments seem to have been predicted by many after the second day of the tournament. The top regions expected at the finals were Capecoast,Greater Accra and Eastern and these predictions were confirmed on saturday when Greater Accra played Eastern in the Boys Finals, whiles Greater Accra played Capecoast in the Girls finals. The much awaited finals unfortunately did not live up to expected competition. 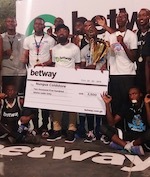 The finals saw Greater Accra dorminating on both sides of the tournament. The Girls finals ended with Greater Accra winning 77 - 39 against Capecoast, whiles the Boys Finals saw Greater Accra in the driving seat from jump ball till the final whistle with 61-37 against Eastern. The Greater Accra Girls team showed great team work and individual talent. The Greater Accra team shocked fans after dorminating capecoast who demolished a team by almost 90points during the group stage matches. In all the championship achieved it's objective of showcasing some of the nation's young talents, but nevertheless had low coverage and publicity. Basketball was amongst the many disciplines during the one week tournament.